Antibody-dependent cellular cytotoxicity (ADCC) has recently been identified as one of the critical mechanisms underlying the clinical efficacy of therapeutic antibodies, especially anticancer antibodies. Therapeutic antibodies fully lacking the core fucose of the Fc oligosaccharides have been found to exhibit much higher ADCC in humans than their fucosylated counterparts. However, data which show how fully non-fucosylated antibodies achieve such a high ADCC in human whole blood have not yet been disclosed. The precise mechanisms responsible for the high ADCC mediated by fully non-fucosylated therapeutic antibodies, even in the presence of human plasma, should be explained based on direct evidence of non-fucosylated antibody action in human blood. Using a human ex vivo B-cell depletion assay with non-fucosylated and fucosylated anti-CD20 IgG1s rituximab, we monitored the binding of the therapeutic agents both to antigens on target cells (target side interaction) and to leukocyte receptors (FcγR) on effector cells (effector side interaction), comparing the intensities of ADCC in human blood. In the target side interaction, down-modulation of CD20 on B cells mediated by anti-CD20 was not observed. Simple competition for binding to the antigens on target B cells between fucosylated and non-fucosylated anti-CD20s was detected in human blood to cause inhibition of the enhanced ADCC of non-fucosylated anti-CD20 by fucosylated anti-CD20. In the effector side interaction, non-fucosylated anti-CD20 showed sufficiently high FcγRIIIa binding activity to overcome competition from plasma IgG for binding to FcγRIIIa on natural killer (NK) cells, whereas the binding of fucosylated anti-CD20 to FcγRIIIa was almost abolished in the presence of human plasma and failed to recruit NK cells effectively. The core fucosylation levels of individual serum IgG1 from healthy donors was found to be so slightly different that it did not affect the inhibitory effect on the ADCC of fucosylated anti-CD20. Our results demonstrate that removal of fucosylated antibody ingredients from antibody therapeutics elicits high ADCC in human blood by two mechanisms: namely, by evading the inhibitory effects both of plasma IgG on FcγRIIIa binding (effector side interaction) and of fucosylated antibodies on antigen binding (target side interaction). The clinical successes of therapeutic antibodies have been demonstrated by improvement of overall survival and time to disease progression in various types of malignant diseases, such as breast, colon, and hematological cancer [1–5]. As molecular-targeted therapeutics, therapeutic antibodies that bind to specific cell-surface antigens on target cells can induce cytotoxicity via the effector functions of antibody-dependent cellular cytotoxicity (ADCC) and complement-dependent cytotoxicity (CDC) through the constant region of the antibody (Fc), and apoptosis of target cells directly [6–9]. Recently, some clinical evidence based on genetic analysis of leukocyte receptor (FcγR) polymorphisms of cancer patients treated with anti-CD20 IgG1 rituximab and anti-HER2 IgG1 trastuzumab therapies has revealed that ADCC is one of the critical mechanisms responsible for the clinical efficacy of these therapeutic antibodies [10–14]. A significant correlation has also been reported between the clinical responses to the therapies and the low-affinity FcγR polymorphisms in rituximab-treated patients of systemic lupus erythematosus (SLE) and Waldenstrom's macroglobulinemia, in Crohn's disease patients treated with anti-TNF-α IgG1 infliximab, and in pregnant women with fetal hemolytic disease treated with anti-RhD [12, 15–17]. Hence, ADCC enhancement technology is expected to play a key role in the development of therapeutic antibodies with improved clinical efficacy. Indeed, a number of preclinical and clinical trials using such non-fucosylated antibody therapeutics are now underway. Although various therapeutic antibodies confer great benefits to patients, they also present serious issues of cost-effective performance; as it has been pointed out, some of the currently approved therapeutic antibodies are unable to induce more than remission of cancer despite the fairly high cost of the therapy. Recently, the inhibition of therapeutic-antibody ADCC by plasma IgG, probably through competition for binding of the therapeutics to FcγR on effector cells, is found to be at least partly responsible for the large dose requirement in antibody therapies [18, 19]. On the other hand, fully non-fucosylated anti-CD20 rituximab is shown to exhibit strong ADCC at lower concentrations (10 to 100 ng/mL) with much higher efficacy than that of its fucosylated counterparts, even in the presence of plasma IgG [20, 21]. However, the basic data elucidating how fully non-fucosylated antibodies show such a high ADCC in human whole blood have not yet been disclosed. The precise mechanisms responsible for the high ADCC mediated by fully non-fucosylated therapeutic antibodies, even in the presence of human plasma, should be explained based on direct evidence of non-fucosylated antibody action in human blood. Understanding the behavioral differences between non-fucosylated and fucosylated therapeutic antibodies in human blood can provide a new clue for improving antibody therapies. In this study, we explored the mechanisms by which non-fucosylated therapeutic antibodies induce much higher ADCC in human blood than do fucosylated therapeutics. As a model of human in vivo, we employed a human B-cell depletion assay with anti-CD20 IgG1 rituximab, and focused on the actual binding to the two key cellular components of effector and target cells in human blood: namely, the binding through FcγRIIIa to natural killer (NK) cells (effector side interaction) and the binding through the antigen to target cells (target side interaction). This ex vivo model was considered to be suitable for analyzing the functions of therapeutic antibodies in human blood because it has been shown to reflect well the in vivo intravascular environment [18, 20, 22, 23]. Here, we discuss two ingenious mechanisms underlying the enhanced ADCC efficacy of fully non-fucosylated therapeutic antibodies in human blood, based on data reflecting the actions of antibody molecules in human blood. Blood donors were randomly selected from healthy volunteers registered at Tokyo Research Laboratories, Kyowa Hakko, Co., Ltd. All donors gave written informed consent before the analyses. Human serum samples collected from 12 individuals (5 women and 7 men, aged 20 to 57 years) with written informed consent were purchased from ProMedDx (Norton, MA). Non-fucosylated and fucosylated anti-CD20 IgG1s, and a triple amino acid-substituted anti-CD20 IgG1 rituximab mutant (S239D/S298A/I332E) were prepared as described previously [20, 24]. Anti-CD20 IgG1s were biotinylated using EZ-Link Sulfo-NHS-LC-biotin (Pierce, Rock-ford, IL) according to the manufacturer's instructions. The labeled anti-CD20s were purified by dialysis with Spectra/Pro® 2 Dialysis Membrane (Spectrum Laboratories, Inc., Rancho Dominguez, CA) in phosphate-buffered saline (PBS). The antigen-binding activity of the labeled anti-CD20s was measured by CD20-binding ELISA , and confirmed to be equivalent to that of the non-labeled anti-CD20 and rituximab (Rituxan) purchased from Genentech, Inc. (South San Francisco, CA) prior to use. Human endogenous IgG was fractionated from human serum samples of 20 healthy donors using MabSelect (Amersham Biosciences, Piscataway, NJ). The bound fraction contained IgG1, 2 and 4, whereas the bulk of IgG3 passed through the column. The pool of IgG1, 2, and 4, eluted from the MabSelect, was stored in 10 mM citrate buffer pH 6.0 with 0.15 M NaCl. The concentration of endogenous IgG1 in the pool was measured by human IgG1-specific ELISA using peroxidase-conjugated mouse anti-human IgG1 monoclonal antibodies (clone HP6069; Zymed Laboratories, South San Francisco, CA) as previously described . The Fc of the IgG1 was prepared from the pool by a common procedure including papain cleavage, purification with MabSelect, and Superose12 (Amersham Biosciences) gel filtration chromatography to analyze the Fc oligosaccharide structure. N-linked oligosaccharides were released by digestion of the purified anti-CD20 IgG1 and the Fc of human endogenous IgG1 with N-glycosidase F (Takara, Shiga, Japan). The released carbohydrates were analyzed by matrix-assisted laser desorption/ionization time-of-flight mass spectrometry (MALDI-TOF MS) with a positive-ion mode as described previously . Monosaccharide composition of IgG1 was characterized by modified high-performance anion exchange chromatography (HPAEC) analysis as previously described . Human peripheral blood mononuclear cells (PBMC) were prepared from healthy donors, and washed and resuspended in stain buffer (PBS containing 1% bovine serum albumin (BSA)). B cells were purified from PBMC by B Cell Isolation Kit II (Miltenyi Biotec, Bergisch-Gladbach, Germany) as negative fractions passed through a magnetic separation column (autoMACS™; Miltenyi Biotec). The purity of isolated B cells was more than 95%, as assessed by flow cytometer FACSCalibur (BD Biosciences, San Jose, CA) using anti-CD19-FITC (clone J4.119; Beckman Coulter, Coulter, Miami, FL). Purified B cells were adjusted to 1 × 106 cells/mL and incubated with serial dilutions (0.001 to 10 μg/mL) of anti-CD20 s for 30 min to 4 h at 37°C. The cells were then washed, and incubated with phycoerythrin (PE)-conjugated mouse anti-human IgG (BD Biosciences Pharmingen, San Diego, CA) for 30 min at 4°C to detect binding of anti-CD20s on B cells using FACSCalibur. Cytotoxicity (%) = (1 - (%CD19+CD2- B cells treated with anti-CD20 IgG1)/(%CD19+CD2- B cells treated with PBS)) × 100. The antigen-binding activity of anti-CD20s on human B cells in human whole blood was analyzed by competitive inhibition assay with biotin-labeled anti-CD20 using flow cytometry. Heparinized peripheral blood from healthy donors was incubated simultaneously with 3.3 μg/mL of the biotinylated anti-CD20 (fucosylated or non-fucosylated) and serial dilutions (1 to 100 μg/mL) of non-labeled competitor anti-CD20s on ice for 30 min. Aliquots of samples were washed once with the stain buffer, and incubated with PE-conjugated streptavidin (Beckman Coulter) and anti-CD19-FITC on ice for 30 min. Stained cells were suspended in FACS Lysing Solution (BD Biosciences) to lyse erythrocytes and washed twice with the stain buffer. The binding intensity of biotinylated anti-CD20 to B cells detected with CD19+ was analyzed by FACSCalibur. The FcγRIIIa-binding activity of anti-CD20s on human NK cells in human whole blood was analyzed by flow cytometry using anti-idiotype monoclonal antibodies against rituximab . Heparinized peripheral blood samples from healthy donors or samples, depleted of plasma by washing and reconstituted with stain buffer, were incubated with serial dilutions (1.1 to 30 μg/mL) of anti-CD20s on ice for 30 min. After washing with the stain buffer, the cells were stained with anti-rituximab-FITC (clone MB2 A4, Abcam, Cambridge, UK) to detect anti-CD20s bound to FcγR, and simultaneously stained with PE-Cyanin 5.1 (PC5)-labeled anti-CD3 antibodies PC5 (clone UCHT1, Beckman Coulter) and PE-labeled anti-CD56 antibodies (clone N901, Beckman Coulter) to detect CD3-CD56+ NK cells. 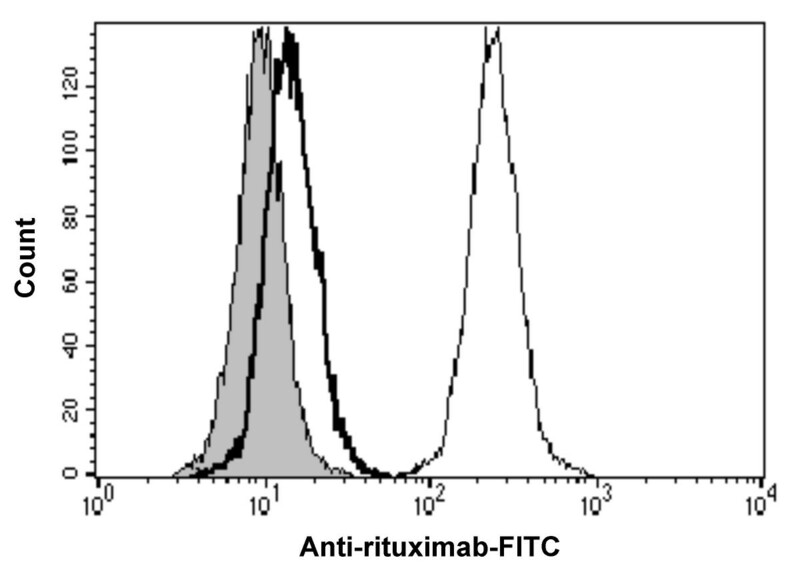 Following incubation on ice for 30 min, the intensity of anti-rituximab-FITC bound to NK cells detected with CD3-CD56+ was analyzed by FACSCalibur. To analyze whether or not the binding of anti-CD20 to NK cells was through FcγRIIIa, samples were incubated simultaneously with 100 μg/mL of non-labeled anti-CD16 antibodies (clone 3G8, Ancell, Bayport, MN) and 10 μg/mL of non-fucosylated anti-CD20 on ice for 30 min, and the anti-CD20 bound to NK cells was analyzed by FACSCalibur. Mouse IgG1 (clone 15H6s, Beckman Coulter) was used as an isotype control. ADCC inhibition (%) = (1 - (cytotoxicity (%) with human serum)/(cytotoxicity (%) without human serum)) × 100. Non-fucosylated and fucosylated anti-CD20s are composed of amino acid sequences identical to that of rituximab, and thus it was confirmed that they exhibited equal CD20 binding activity using the antigen-binding ELISA . The anti-CD20 variant (S239D/S298A/I332E) also bound to the CD20 antigen equally as well as rituximab because the variable region of both forms had the same amino acid sequence . Thus, these anti-CD20s also showed equal binding to human B cells in flow cytometry analyses, and down-modulation of CD20 by anti-CD20s was not observed during 4h-incubation (Fig. 1). Oligosaccharide analysis of the generated anti-CD20s confirmed that the attached oligosaccharides were of a complex biantennary type and that the IgG1 generated by the FUT8 -/- cell line Ms704 contained no fucose residue (Fig. 2). Antigen binding activity of anti-CD20 IgG1 rituximab variants to target B cells. Purified human B cells from healthy donor 1 were incubated with anti-CD20 IgG1 rituximab (open square) and its variants (fucosylated (closed circle), non-fucosylated (open circle), triple amino acid-substituted mutant S239D/S298A/I332E (closed square)) at indicated concentrations at 37°C for 30 min (a), or at 3.3 μg/mL at 37°C for 30, 120 and 240 minutes (b). In both experiments, anti-CD20s bound to CD20 on B cells were detected with PE-conjugated mouse anti-human IgG. Mean fluorescence intensity is indicated by mean values ± SD of triplicates. Oligosaccharide analysis of the anti-CD20 IgG1 rituximab variants. a Each value of composition is the relative amount in total complex-type oligosaccharides detected. b Schematic descriptions of oligosaccharides correspond to: galactose (triangle), N-acetylglucosamine (GlcNAc) (circle), mannose (square), and core fucose (star). c Relative amount of non-fucosylated oligosaccharides. d Data from reference 28. e n.d.: not detected (less than 2.0%). To analyze the ex vivo ADCC activity of each anti-CD20, whole blood samples from two healthy donors (donors 1 and 2) were incubated with serial dilutions of non-fucosylated or fucosylated anti-CD20s (Fig. 3a). Fucosylated anti-CD20 reduced only about 30% of B cells at 10 μg/mL in donors 1 and 2. By contrast, non-fucosylated anti-CD20 showed more than 100-fold potent B-cell depletion activity with much higher efficacy than its fucosylated counterpart in both individuals, with EC50 values of 0.001 μg/mL (in donor 1) and 0.01 μg/mL (in donor 2). The anti-CD20 variant (S239D/S298A/I332E), having higher FcγRIIIa-binding activity than fucosylated wild type anti-CD20, also showed high ex vivo ADCC almost identical to that of non-fucosylated wild type anti-CD20 in both individuals, consistent with the findings of previous reports [21, 24]. A series of mixtures composed of non-fucosylated and fucosylated anti-CD20s at different ratios was prepared by adding serial 3-fold amounts of fucosylated anti-CD20 to a fixed amount (0.11 μg/mL) of non-fucosylated anti-CD20, and ex vivo B-cell depletion activities of the mixtures were measured (Fig. 3b, donor 3). The concentration of 0.11 μg/mL was chosen to be the minimum dose showing saturable ex vivo efficacy in the donor blood (donor 3). There was no significant change observed by the addition of further non-fucosylated anti-CD20, as the initial dose already reached the saturable effective dose. 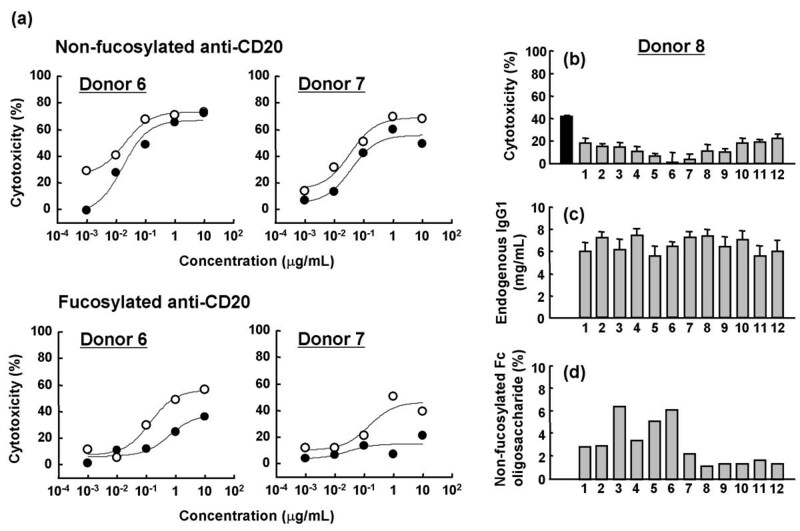 The addition of the fucosylated anti-CD20 to non-fucosylated anti-CD20 depressed the ex vivo B-cell depletion activity in a dose-dependent manner; thus, the ex vivo B-cell depletion activity of the mixture consisting of fucosylated and non-fucosylated anti-CD20s did not reach that of the antibody sample consisting of non-fucosylated anti-CD20 alone. Ex vivo B-cell depletion activity of anti-CD20 IgG1 rituximab variants in a whole blood matrix. (a) Heparinized peripheral blood from healthy donors 1 and 2 were incubated with serial dilutions of anti-CD20 IgG1 rituximab variants (fucosylated (closed circle), non-fucosylated (open circle), triple amino acid-substituted mutant S239D/S298A/I332E (closed square)). No significant difference in cytotoxicity was observed between non-fucosylated and triple amino acid-substituted mutant S239D/S298A/I332E by paired t-test. (b) Non-fucosylated anti-CD20 was added to the whole blood sample from donor 3 at 0.11 μg/mL (white column). Non-fucosylated (gray column) or fucosylated (black column) anti-CD20 was further added to the reaction at final concentrations as indicated. In both experiments, the remaining B cells after 4-h treatment were stained with anti-CD19-FITC, and the samples were analyzed on a flow cytometer to quantify the number of B cells. B-cell depletion is represented as cytotoxicity (%) as described in Materials and Methods. To address the reason why non-fucosylated anti-CD20 induced a higher ex vivo ADCC efficacy than did fucosylated anti-CD20, the binding of anti-CD20s to NK cells was analyzed in human whole blood matrices using anti-rituximab-FITC in donor 4, who showed a similar B-cell depletion pattern with anti-CD20 as donor 2. The binding of anti-CD20 to NK cells was confirmed to be mediated mostly through the interaction of the Fc region with FcγRIIIa on NK cells since anti-CD16 antibody 3G8 inhibited the binding (Fig. 4). 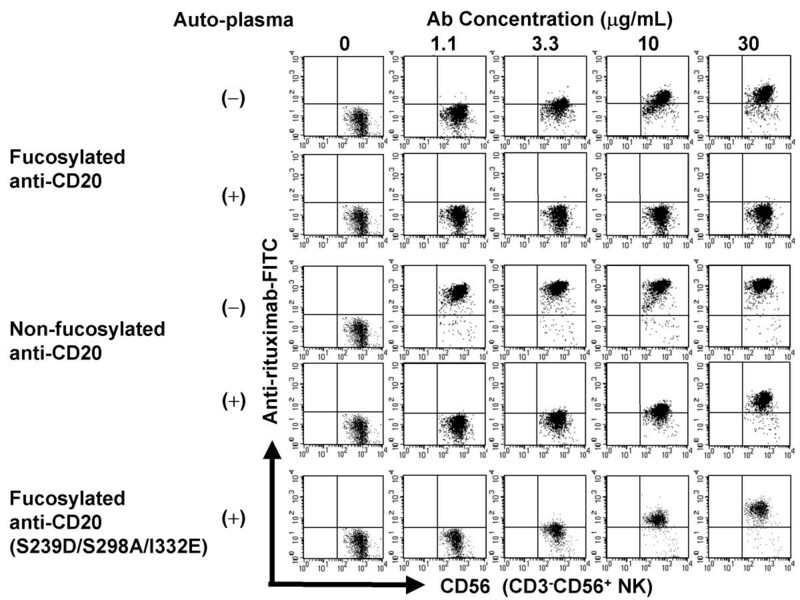 Non-fucosylated anti-CD20 exhibited markedly stronger binding to NK cells than fucosylated anti-CD20 in terms of the ratio of anti-CD20 positive NK cells and the staining intensity of anti-CD20 per NK cell (Fig. 5). 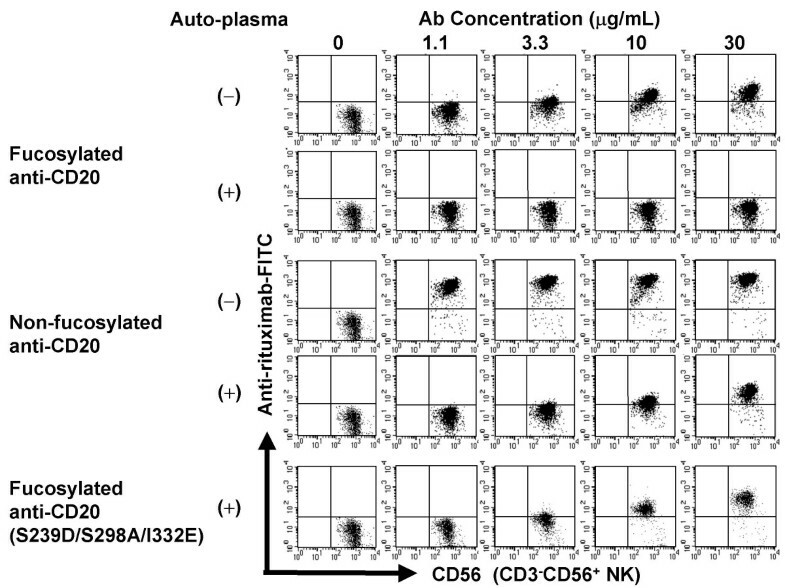 It is worth noting that non-fucosylated and variant (S239D/S298A/I332E) anti-CD20s still retained high binding activity for NK cells in the presence of plasma, while the binding of fucosylated anti-CD20 to NK cells was almost abolished in the presence of plasma. Ex vivo binding of non-fucosylated anti-CD20 IgG1 rituximab to FcγRIIIa on NK cells. Heparinized peripheral blood from donor 4 was incubated with non-fucosylated anti-CD20 IgG1 10 μg/mL (blank histogram) or stain buffer alone (filled histogram), in the presence of anti-CD16 antibody 3G8 (bold line) or mouse IgG1 isotype control (solid line). CD3-CD56+ NK cells were gated in the histogram. The binding of non-fucosylated anti-CD20 IgG1 to FcγRIIIa on NK cells was detected by anti-rituximab-FITC. Ex vivo binding activity of anti-CD20 IgG1 rituximab variants to FcγRIIIa on NK cells. Heparinized peripheral blood from donor 4, or blood depleted of auto-plasma by washing and reconstitution with stain buffer, was incubated with serial dilutions of anti-CD20 IgG1s. Anti-CD20 IgG1 rituximab variants bound to FcγRIIIa on CD3-CD56+ NK cells after incubation on ice for 30 min were detected by anti-rituximab-FITC. The binding of anti-CD20 to target B cells was also analyzed in human whole blood matrices (donor 5) using a competitive inhibition assay with biotin-labeled anti-CD20s. 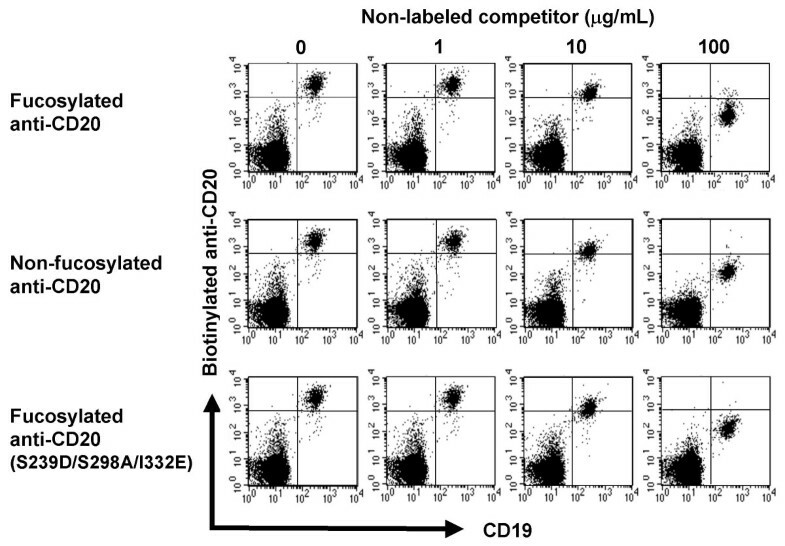 Biotinylated anti-CD20s that retained antigen-binding activity comparable to that of non-labeled anti-CD20 were employed in the competitive inhibition assay. As shown in Fig. 6, the ex vivo binding of biotinylated anti-CD20 (3.3 μg/mL) was inhibited by non-labeled anti-CD20 in a dose-dependent manner, irrespective of fucosylation or amino acid mutation of the Fc region of the added anti-CD20; i.e., fucosylated, non-fucosylated and triple amino-acid-substituted anti-CD20s exhibited an identical antigen-binding activity on the target B cells in human whole blood. Ex vivo binding activity of anti-CD20 IgG1 rituximab variants to CD20 on B cells. Heparinized peripheral blood from donor 5 was incubated simultaneously with 3.3 μg/mL of biotinylated anti-CD20 IgG1 and serial dilutions of non-labeled competitor anti-CD20 IgG1 rituximab on ice for 30 min. The remaining biotinylated anti-CD20 IgG1 bound to CD20+ B cell was detected by streptavidin-PE using FACS analysis. Data for the binding of biotinylated fucosylated anti-CD20 are shown. The inhibitory effect of human plasma on ADCC induced by anti-CD20s was confirmed by an in vitro ADCC assay with purified PBMC in the presence or absence of plasma (donors 6 and 7). In this assay, fucosylated or non-fucosylated anti-CD20 (1 μg/mL) was employed as an ADCC inducer against target B cells, and B-cell depletion mediated by the ADCC was measured by flow cytometry. The ADCC of anti-CD20s was inhibited by autologous plasma (greatly in fucosylated and slightly in non-fucosylated anti-CD20s) (Fig. 7a). However, in the absence of plasma, fucosylated anti-CD20 showed quite high ADCC (exceeding 40% cytotoxicity) compared with the case in the presence of plasma, and this value was fairly close to that of non-fucosylated anti-CD20. Next, we focused on whether or not individual differences in endogenous human plasma modulate the inhibitory effects on ADCC induced by fucosylated anti-CD20 (1 μg/mL) (Fig. 7b, c, d, donor 8). Human sera from 12 healthy individuals were employed; the individual sera themselves were confirmed not to show any detectable cytotoxic activity against human B cells in this experiment. Although the 12 individual sera displayed slight differences in terms of IgG1 concentration (5.3 to 7.5 mg/mL) and the relative amount of non-fucosylated Fc oligosaccharides (1.2 to 6.5%), consistent with previous reports [30, 31], the intensity of inhibitory activity of individual serum against the ADCC of fucosylated anti-CD20 did not significantly correlate with these differences. Influence of human plasma on ADCC activity of fucosylated anti-CD20. (a) B-cell depletion activity of non-fucosylated and fucosylated anti-CD20 was analyzed using purified PBMC with (closed circle) or without (open circle) auto-plasma (donors 6 and 7). Cytotoxicity (%) after 4-h treatment was calculated as described in Materials and Methods. (b) B-cell depletion activity of fucosylated anti-CD20 was analyzed using purified PBMC from donor 8 with (gray column) or without (black column) allo-serum from 12 healthy adult individuals. Cytotoxicity (%) after 4-h treatment was calculated as described in Materials and Methods, and is indicated by mean values ± SD of triplicates. Individual differences in endogenous IgG1 profiles of the allo-serum, endogenous IgG1 concentration (c) (indicated by mean values ± SD of triplicates) and relative amounts of non-fucosylated IgG1 Fc oligosaccharide (d) were also analyzed. The fucosylated and non-fucosylated anti-CD20 IgG1s (Fig. 2) with known fucosylation level and antibody concentration (2 mg/mL and 10 mg/mL) were used as standard antibodies for experiments (c) and (d). 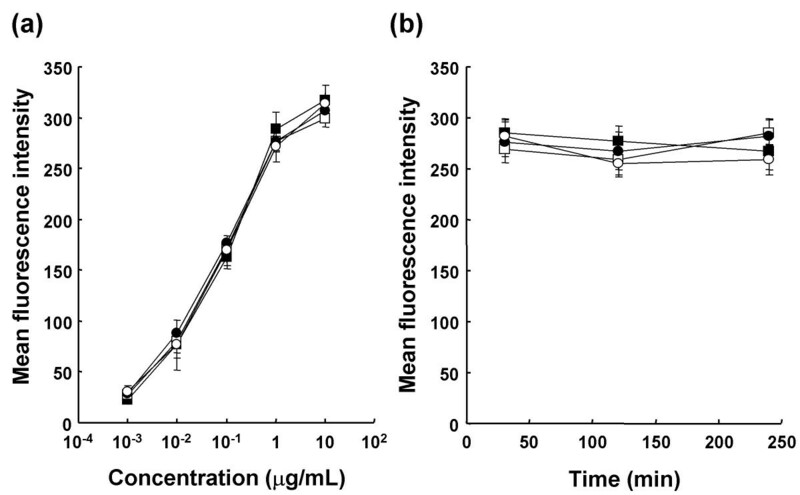 Currently, the application of human IgG1 fully lacking core fucose in the Fc oligosaccharides is expected to be a promising approach for next-generation therapeutic antibodies with improved efficacy, even when administrated at low doses in humans in vivo. In order to develop fully non-fucosylated therapeutic antibodies as new medicine, the pharmacodynamic characteristics of the antibodies should be elucidated: how fully non-fucosylated antibodies effectively mediate two key cellular component interactions of effector and target cells to exercise high ADCC and what the differences are between non-fucosylated and fucosylated antibodies in these actions. In this study, we addressed non-fucosylated antibody actions in human blood. Firstly, we were surprised that the binding of fucosylated antibodies to NK cells was not detected, even at the high concentration of 30 μg/mL, in the presence of human plasma (Fig. 5). A common feature of the antibody therapies against cancers is that their anti-tumor efficacies typically require weekly administration of a high dose (2–8 mg/kg) over several months to maintain effective serum concentrations exceeding 10 μg/mL [32–34]. Thus, it is realized that currently-licensed therapeutic antibodies mostly do not bind to NK cells in human blood after administration. On the other hand, the binding of antibodies to target cells was detected at a concentration of 3.3 μg/mL, irrespective of the presence of human plasma (Fig. 1, 6). The antigen binding of therapeutic antibodies to target cells appears to be simply determined by their specificity and affinity. In current antibody therapies, administered therapeutic antibodies seem to have sufficient capability to concentrate in the target cells accessible from the bloodstream, but not to capture effector cells in the target sites effectively. We confirmed the inhibitory effects of human serum IgG on the ADCC of therapeutic antibodies, consistent with previous reports [18–21, 35]. ADCC of fucosylated antibodies was significantly affected by human plasma IgG (Fig. 7a). In contrast, non-fucosylated antibodies showed much stronger binding to FcγRIIIa on NK cells, even in the presence of human plasma IgG, resulting in much higher potency and efficacy of non-fucosylated compared to fucosylated antibodies (Fig. 3a). In our experiments, the concentrations of therapeutic antibodies required for inducing ex vivo ADCC and binding to FcγRIIIa on NK cells were not necessarily consistent. This discrepancy seemed to reflect the fact that human serum IgG bound to FcγRIIIa on NK cells might be more effectively displaced by therapeutic antibodies bound to the surface of target cells than unbound forms, possibly due to an avidity effect via formation of a polyvalent FcγRIIIa-binding matrix, and consequently promoting recruitment of NK cells. Interestingly, a triple amino acid-substituted mutant (S239D/S298A/I332E) showed almost identical ex vivo ADCC and NK cell binding to that of the non-fucosylated wild type (Fig. 3a, 5), although the mutant was shown to have higher affinity than the non-fucosylated wild type for recombinant FcγRIIIa in vitro . The binding affinity estimated by solid-phase assay with recombinant protein forms might not necessarily be the same as the affinity to the native structure forms on the cell surface; thus, the equivalency in anti-CD20 efficacy was observed. Before starting these experiments, we speculated that the concentration of human plasma IgG1 is so huge that its fucosylation level might affect the inhibitory activity of ADCC induced by therapeutic antibodies, even though the proportion of non-fucosylated IgG1 is very low. Indeed, human plasma contains 5 mg/mL of endogenous IgG1 , which is approximately 100-fold higher than the serum trough concentration of rituximab . However, contrary to our speculation, we could not detect any significant difference caused by variations in serum IgG1 fucosylation levels in healthy individuals (Fig. 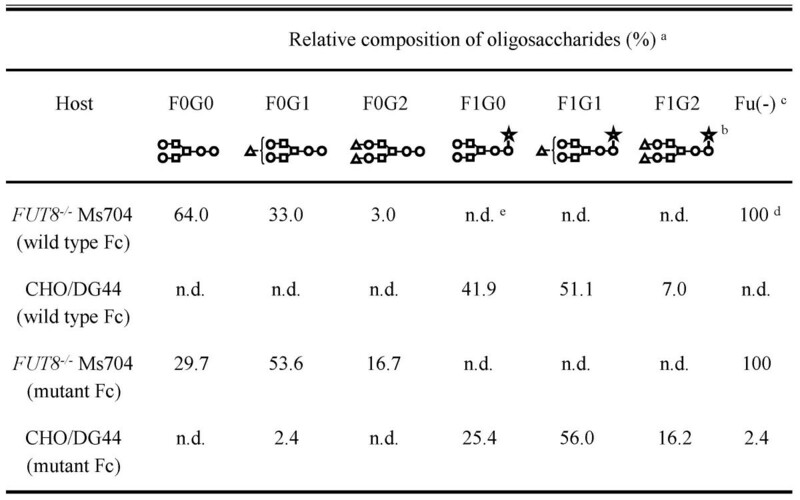 7) although individual human serum IgG1 from 12 healthy donors showed slight variations in the concentration (5.3 to 7.5 mg/mL) and the content of non-fucosylated oligosaccharide structures (1.2 to 6.5%). Factors other than endogenous IgG1 concentration and fucosylation levels, such as variations of other endogenous IgG subclasses, might also be involved in the ADCC inhibitory activity of human serum IgG from healthy individuals. Some leukemia patients are reported to increase their relative levels of non-fucosylated Fc oligosaccharides . It is still thought to be interesting to explore whether individual patient variations in endogenous IgG1 fucosylation level might affect the efficacy of antibody therapies. We also confirmed that enhanced ex vivo ADCC of non-fucosylated therapeutic antibodies is inhibited by their fucosylated counterparts, consistent with previous reports [20, 21, 27]. In our experiments, down-modulation of CD20 antigen on B cells mediated by anti-CD20 was not observed (Fig. 1), and simple competition for binding to the antigens on target B cells between fucosylated and non-fucosylated anti-CD20s was detected in human blood (Fig. 6), resulting in inhibition of the enhanced ADCC of non-fucosylated anti-CD20 by fucosylated anti-CD20. Thus, the mechanism by which ADCC induced by non-fucosylated antibodies is inhibited by fucosylated forms is mainly through competition of the two forms for the antigens on target cells. In other words, the density of the non-fucosylated form on the target cells is reduced by fucosylated form occupation, which causes an effect to shed the target antigens from capture by the therapeutic agent having high ADCC activity even in plasma. To overcome interference from human plasma IgG and recruit NK cells to the target cells effectively, the key is to coat the target cells with therapeutic agents having higher binding affinity to FcγRIIIa than plasma IgG, such as fully non-fucosylated IgG1. The non-fucosylated form of IgG1 is a natural component in human serum IgG, and is also observed as a trace ingredient in currently-licensed therapeutic antibodies [37–40]. It will be great benefits for patients if the proportion of the non-fucosylated form is increased in antibody therapeutics. Our findings demonstrate that removal of fucosylated antibody ingredients from antibody therapeutics elicits high ADCC, even in human blood, via two mechanisms: namely, by evading the inhibitory effects both of plasma IgG on the binding of FcγRIIIa on NK cells and of fucosylated counterparts on the binding of the antigen on target cells. Thus, antibody therapy consisting of fully non-fucosylated IgG1, not including the fucosylated form, is worth to apply as next-generation antibody therapy with improved efficacy at a reduced dose for patients, which will have a great impact especially on human cancer therapy based on the ADCC mechanism. The authors would like to thank Dr. George Spitalny for helpful suggestions and critical reading of the manuscript. We are also very grateful for the technical support provided by Miss Masako Wakitani and Ms. Ai Sato-Kubota. SI designed the study; participated in the purification and the biological activity analysis of the antibodies; carried out the ex vivo and in vitro ADCC assays; and drafted the manuscript. RKK participated in carrying out the flow cytometric analysis. KM participated in the FcγRIIIa binding analysis of the antibodies. HM participated in carrying out the ex vivo and in vitro ADCC assays. MI participated in the purification and biological analysis of human endogenous IgG1. AO participated in the analysis of antibody-derived N-linked Fc oligosaccharides. KS was the director of the laboratories that carried out the present study and also discussed the study from scientific points of view. MS was the head of the laboratories that carried out the present study, initially conceived of the study, and helped to design the study and drafted the manuscript. All authors read and approved the final manuscript.